The Kiwifruit farming in Kenya by majority of small farmers is a very encouraging attempt. 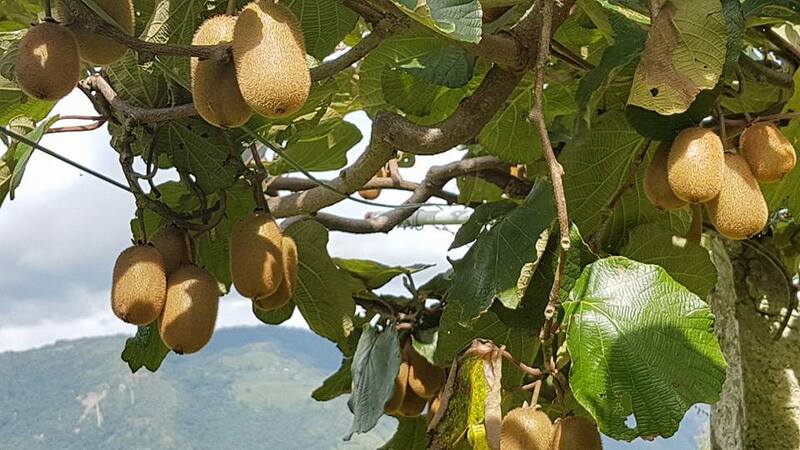 We can see that Kenya has all the possibilities in the world as the climate and altitudes are very suitable for its farming which are helpful to be a major force in Kiwifruit production. We have huge exportable market of it. Reliable supply chain, guarantee of quality, competitive pricing and a sound storage system that could help kiwifruit to grow. Find a good spot in your farm for your kiwifruit. Make sure conditions there are suitable. You will need adequate space for your kiwifruit plants to grow. Most kiwifruit plants grow best in either full sun or light shade. Kiwifruit generally need slightly acidic soil that has a pH between 6.0 and 6.5. If your soil is too alkaline, you can try to acidify it to make conditions right for growing kiwifruit. Build a sturdy trellis for your plants. 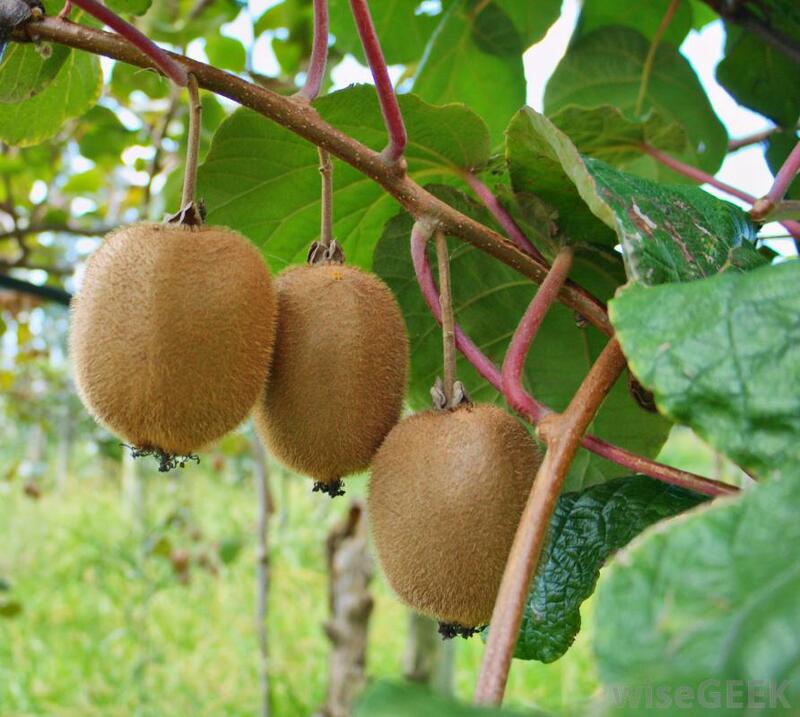 Remember that kiwifruits are vine plants that can grow up to 30 feet long and weigh a fair amount. Like other vines, they grow best across vertical structures that provide support and greater access to light. Kiwifruit vines can grow on most types of trellises, gazebos, and fences. Transplant the young plants. Transplanting kiwifruit plants is largely the same as other types of plants. The major difference is that you must space your plants so that each is at the base of its own support structure. Simply dig a hole for each plant that is a little bigger than their current pots. Carefully lift each plant out of its pot, including the roots and the dirt they cling to, and place the roots into the holes you just dug. Finish by filling in the edges of the hole with loose dirt. Try to disturb the roots as little as possible to avoid shock. If you plant to grow fruit, keep as many plants as you have room for. Once they flower, which can take up to five years, you can identify the male and female plants and cull the extras. Protect your kiwifruit from animals. Even if all other conditions are perfect, your plants may be destroyed by various pests. Kiwifruit plants will be especially vulnerable until they have fully matured. The leaves of kiwifruit plants can sometimes attract deer. Keep your young plants safe by keeping domestic animals out of your yard with either a fence around it or chicken wire surrounding your plants. Cats respond to kiwi leaves similarly to catnip. If there are outdoor cats in your area, take measures to keep them out of your garden. Example strategies include building a fence, putting chicken wire around each of your plants, and spraying with repellents. Unlike many other commercial fruit-bearing plants, kiwifruit do not have many insect enemies, so regular pesticide use is usually unnecessary. Tie shoots to supports. As your kiwifruit plant grows, it will begin to send out shoots. You will need to train these shoots to grow on the support by wiring the vines to the trellis. This will ensure that the plant will grow a strong “trunk” section.  Prune your plants regularly. You should prune your kiwifruit plants once a year. Trim excess canes (vines that have grown a bark-like skin) and any lateral shoots not supportable by its trellis. Lateral shoots are branches that go off to the sides. Your kiwifruit vines will not be able to support the weight of such shoots on their own until they’ve reached the top of your trellis (when using the T-support system). Once the vines reach the top of the trellis, they will be able to grow more horizontally across it. The optimal time for pruning female plants is late winter while the plant is dormant. Male plants can be pruned sooner, right after flowering. Cull the male plants. 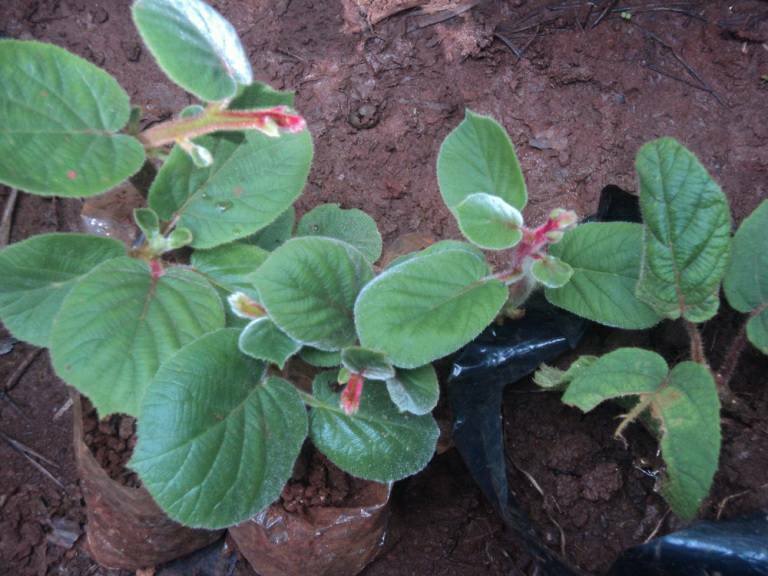 Kiwi plants will usually flower within 3-4 years of planting. When this happens, you can identify the male plants by the bright yellow, pollen-covered anthers in the flower’s center. The female plants have sticky stalks (stigma) in the center instead, and white ovaries at the base of the flower. Harvest your fruit once it’s ripe. 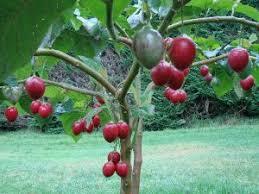 After a few years (or even that same year for hardy and super-hardy kiwi), your plants should start producing fruit. Yields may start out small but typically increase every year as the plant matures. Kiwifruit usually ripens in September and October. If frosts typically happen by then in your area, you will need to harvest the fruit before it’s ripe and let it finish ripening under refrigeration. Internationally Kiwifruit is considered as one of the best and high valued fruits. Currently in Kenya one piece of a kiwifruit costs Ksh100. Let’s think and work in its farming and production. Book your seedlings today! Through our farms and experience, we have seen farmers make extraordinary profits through tree-tomato farming. Let us now explore the profits you can get through this kind of investment. We will assume you want to plant tree tomatoes on your five-acre land. 1 Acre can be planted 1200 tree-tomatoes seedlings with a spacing of 2 ½ by 2 ½ ft.
For better Understanding, let us now tabulate the information. NB! 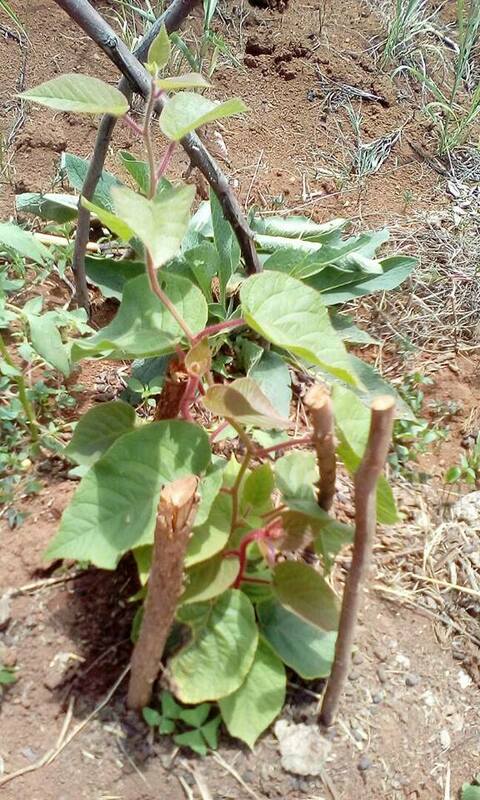 Throughout our research during planting and harvesting, we have noticed that not all trees yield 100% and so in the above example, we have subtracted 10-15% of the total planted seedlings in the five acres to make it 5000 that is less 1000 trees, we are assuming even if the 1000 trees would reach maturity, they won’t be as productive as the rest. We at Oxfarm would want to be as honest as it is rather than give our farmers figures that might only appear good but do not really add up. What we can do to our willing farmer is to inspect your land, conduct soil sampling and testing, water availability survey, land topography survey, selling our grafted tree tomatoes to you. We treat your farm like is yours by giving you free consultation and ensuring you reach the highest levels in farming. You will realize that we have calculated on the downside by selling a fruit at 5 although the current market is at Ksh 10 and Kgs per tree per year at 30Kgs while it can go as high as 50 basically because we want our farmers to have a clear picture. If you have any questions regarding tree tomatoes, don’t be left behind, contact us or visit our offices and we will gladly help you. According to World Agroforestry Centre (ICRAF), many fruits are, for example, important sources of vitamins A and C that are lacking in the diets of many Africans. Low intake of vitamin A – around 50 million African children are at risk of deficiency – is considered to be Africa’s third greatest public health problem after HIV/AIDS and malaria. Vitamin C, on the other hand, is essential for protecting cells and keeping the body healthy and also absorbing iron from food. Vitamin C is an important mineral that is present in significant quantities in many fruits. 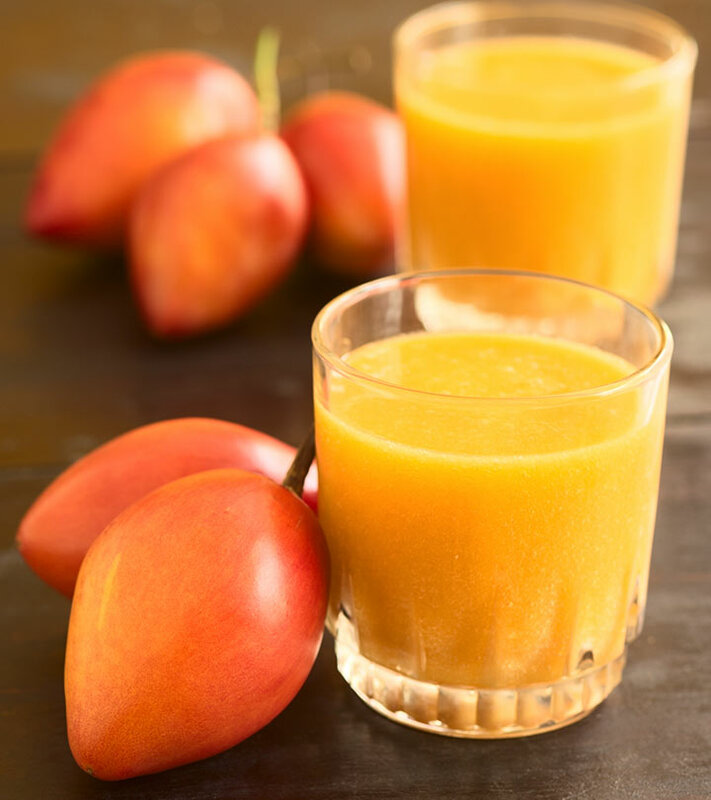 Common fruits include HASS Avocado, Grafted Tree tomatoes, oranges, mangoes, grapes, tangerines e.t.c. Nuts on the other hand include MACADAMIA nuts, groundnuts, cashew nuts, e.t.c. Action on improving fruit and nut availability and quality, when coordinated, is likely to have a major positive impact on the health of African consumers and increase income generation. If farmers receive good incomes from cultivating high quality fruits and nuts, that consumers can afford and are informed about the benefits of eating them, a strong domestic production sector can develop in Kenya. The cultivation of fruits and nuts by smallholders to feed local markets and support of export markets presents a tremendous opportunity for investment, especially if the indigenous species that are recognized and valued by domestic consumers are considered as well as exotic ones. At present, about 80% of the total market value of fruit and nut crops is earned locally in Kenya, and this market is likely to grow further in the coming decade. The total value of all traded production was estimated to be 650 million USD in Kenya in 2007, of which around 85% was contributed by fruits and 15% by nuts. Many fruit and nut species are rare assets in that they can be established on farms with a very modest initial investment and their value increases with time and is maintained over many years, continuing to contribute to family livelihoods and to bringing women, men and children out of poverty in a sustainable way. By conserving these genetic resources in farmland – of indigenous species that are threatened in the natural landscape as forests recede, and of locally adapted exotic species – they are also made available to future generations, so that their livelihoods and health can also benefit. Moreover, fruit and nut production is not amenable to much mechanization and is therefore labor-intensive, and thus plays to one of the key strengths of smallholders, which is their low labor cost, enabling them to compete with larger farmers. With smallholders being unaware of better propagation, pest management and irrigation methods to improve quality, increase productivity and profits. In addition, farmers face market constraints, such as poor post-harvest practices that reduce sale ability, poor market delivery systems, lack of knowledge about the species and varieties for which markets are available, and lack of awareness among consumers of the health benefits of eating fruits and nuts. Kenya has a very big market potential, since in most parts of Kenya, fruits are available throughout the year. This is a very long period and can be utilized to beat the export market. The major challenges facing the fruit marketing in Kenya are the competition from other producers such as South Africa and Israel; these can only be addressed by improving the quality of the fruits produced. NB! If you need to grow tree fruits, Macadamia nuts or tissue banana, kindly visit our offices or contact us. Kiwi is a rapidly growing vining plant that produces delicious, bright green fruit with a non-edible fuzzy brown exterior. The fruit is the most nutritious fruit in the world.Kiwi is a temperate fruit and it can do well in the temperate regions of Kenya like Central, Western highlands, Central Rift Valley and others. It can grow in a wide range of soils provided they are well-drained and have pH of 5.0 and 6.5. In order for the plant to set fruit, both male and female kiwi vines are necessary; in fact, at least one male plant for every eight female kiwi plants is required. With a flavor somewhere between pineapple and berries. Female vines 15 feet apart generally; some hardy kiwis can be planted closer together at 8 feet apart. The males do not need to be right next to the females but at least within a distance of 50 feet. They can also be planted right next to the female if you have a space issues. In Kenya it is one of the most expensive fruit each fruit retailing between sh 100 to 150. The fruit matures after 2 years and has a lifespan of more than 30 years. Where to plant your fruit trees is an important consideration when starting your orchard. Ideally you want good drainage, good soil, plenty of sunshine (fruiting trees require a minimum of 6-8 hours of sun per day during the growing season), and good air flow. You want your trees to be wind protected and try to avoid low-lying sites. A slope is the best location, if you have one. Fertile soils with a depth of more than 1.5 meters and pH range of 5.8–6.6 are ideal for growing fruit trees. Dig large holes before planting fruit trees. The tree holes need to be large enough to accommodate the root system, a 2 feet diameter is a good measurement. Mix well with the existing soil and good quality compost. Mulching and composting are an important part of the orchard. The proposed orchard’s site has to be cleared as thoroughly as possible of perennial weeds, undergrowth, trees, stumps, roots, trash and debris. This should be followed by levelling of unwanted anthills and the elimination of their destructive inhabitants. To achieve a good tilth of the cleared land, fruit growers are advised to plant an annual crop a year before starting fruit cultivation. After this annual crop has been harvested, the final re-ploughing, harrowing and levelling is carried out. The choice of suitable fruit species and cultivars to grow is one of the most important prerequisites for successful fruit farming. A cultivar must be adapted to the environmental conditions of the locality in which it is to be grown, and there should be a good market demand for it. For many fruits there is an extended list from which to choose. Kiwifruit (often shortened to kiwi) or Chinese gooseberry is the name given to the edible berries of several species of woody vines in the genus Actinidia. It has a fibrous, dull greenish-brown skin and bright green or golden flesh with rows of tiny, black, edible seeds. The fruit has a soft texture and a sweet but unique flavor. Kiwi vines grow well in areas with adequate rainfall and well-drained soil. Think about areas that are neither too wet nor too dry and preferably with red soil which tends to be well drained. For example Uasin Gishu, Nakuru, Western Kenya, some parts of Kajiado, warmer parts of Central and Nairobi areas. Actinidia deliciosa (previously A. chinensis). The genus name Actinidia comes from the Greek meaning ray, alluding to the styles of flowers (the maleflower parts) that radiate like spokes of a wheel. Plant the vines at around the month of March to take advantage of long-rains or put an irrigation system. Also add a compost manure to provide the crop with adequate nutrients. Kiwi plants are susceptible to a bacterial infection known as Psa and so you may need to invest in biochemicals that are usually used on fruits like oranges and grapes. Often in commercial farming, different breeds are used for rootstock, fruit bearing plants, and pollinators. Therefore, the seeds produced are crossbreeds of their parents. Even if the same breeds are used for pollinators and fruit bearing plants, there is no guarantee that the fruit will have the same quality as the parent. Additionally, seedlings take seven years before they flower, so determining whether the kiwi is fruit bearing or a pollinator is time consuming. 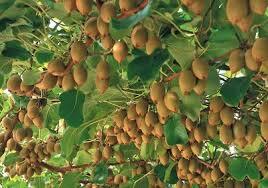 Therefore, most kiwifruits, with the exception of rootstock and new cultivars, are propagated asexually. 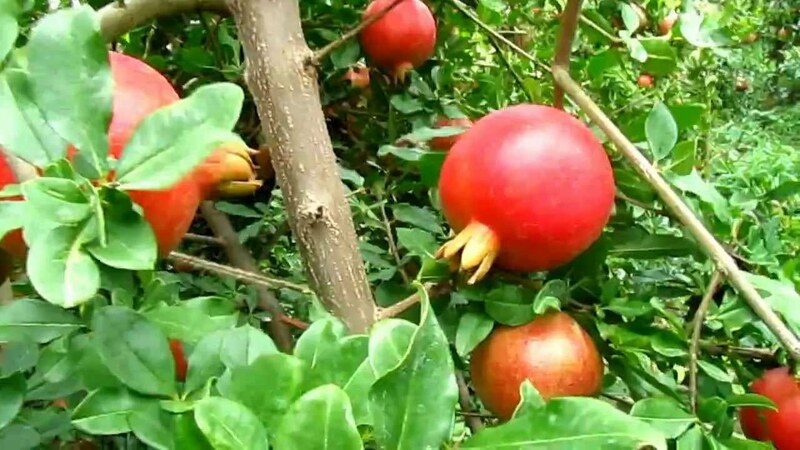 This is done by grafting the fruit producing plant onto rootstock grown from seedlings or, if the plant is desired to be a true cultivar, rootstock grown from cuttings of a mature plant. Most of the plants require a male plant to pollinate a female plant for the female plant to produce fruit (dioecious). For a good yield of fruit, one male vine for every three to eight female vines is required. Other varieties can self-pollinate, but they produce a greater and more reliable yield when pollinated by male kiwifruit vines. 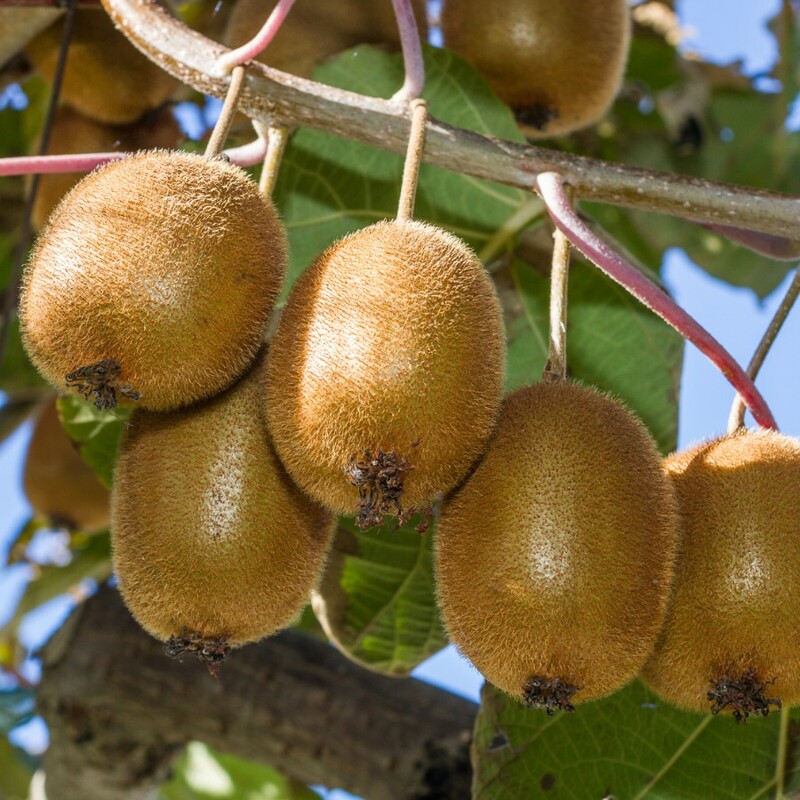 Kiwifruit is picked by hand, and commercially grown on sturdy support structures, as it can produce several tonnes per hectare, more than the rather weak vines can support. These are generally equipped with a watering system for irrigation and frost protection in the spring. Kiwifruit vines require vigorous pruning, similar to that of grapevines. Fruit is borne on one-year-old and older canes, but production declines as each cane ages. Canes should be pruned off and replaced after their third year. Four year-old plants can produce up to 6500 kg per acre while eight year-old plants can produce 8,000 kg per acre. The plants produce their maximum at 8 to 10 years old. The seasonal yields are variable, a heavy crop on a vine one season generally comes with a light crop the following season. Fruits harvested when firm will ripen when stored properly for long periods. This allows fruit to be sent to market up to 8 weeks after harvest. Firm kiwifruit ripen after a few days to a week when stored at room temperature, but should not be kept in direct sunlight. Faster ripening occurs when placed in a paper bag with an apple, pear, or banana. Once a kiwifruit is ripe, however, it is preserved optimally when stored far from other fruits, as it is very sensitive to the ethylene gas they may emit, thereby tending to over-ripen even in the refrigerator. If stored appropriately, ripe kiwifruit normally keep for about one to two weeks. A medium size kiwifruit (76 grams) provides 46 calories, 0.3 g fat, 1 g protein, 11 g carbohydrates, and 2.6 g dietary fiber found partly in the edible skin. Kiwifruit is a rich source of vitamin C (112% of the Daily Value per 100 grams) and vitamin K, and a good source of dietary fiber and vitamin E (nutrient tables, right). 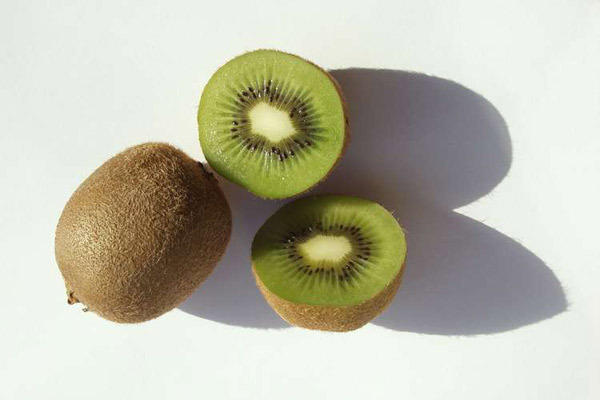 Kiwifruit seed oil contains on average 62% alpha-linolenic acid, an omega-3 fatty acid. Kiwifruit pulp contains carotenoids, such as provitamin A beta-carotene, lutein and zeaxanthin. Kiwifruit may be eaten raw, made into juices, used in baked goods, prepared with meat or used as a garnish. The whole fruit including the skin is suitable for human consumption, but the skin is often discarded due to its texture.